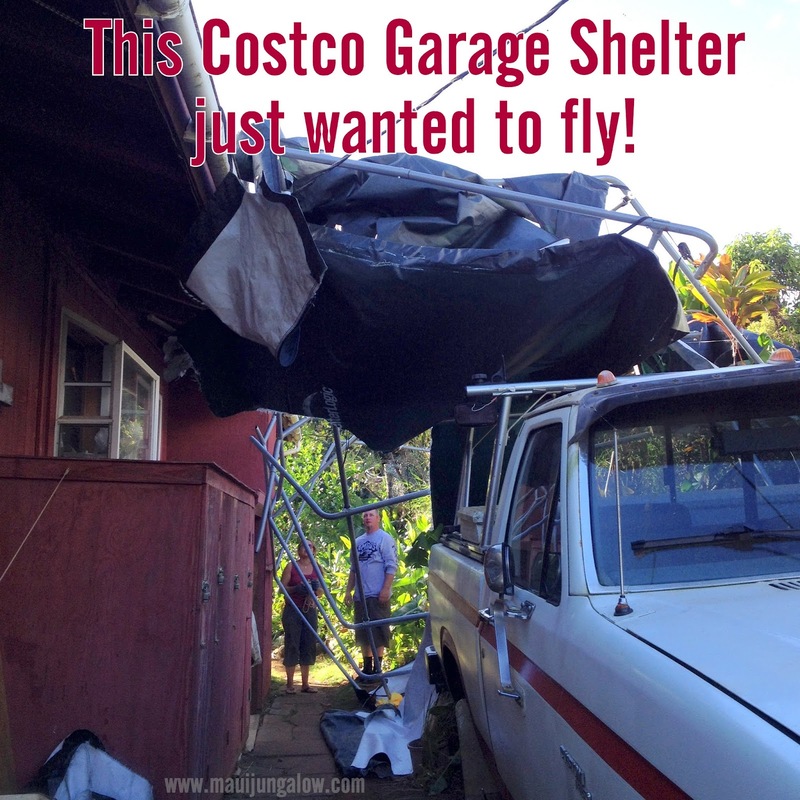 Maui Jungalow: Beware of Flying Costco Garage Shelters! They really do fly, especially in the recent windstorm we had on Valentine’s Day. This flying garage flew over the fence from our neighbor’s house and landed against our house and the truck, hitting the power lines to our house (and to several other houses). It also melted the wire for Oceanic Cable going to our neighbor’s house. touch metal or water touching live power lines. Car canopies or portable fabric garages, are very prone to getting damaged on Maui. They have to be securely fastened to the ground, with rebar and strap fasteners or other secure hardware. Not just duct tape. Even if they don’t fly, the wind can still shred the heck out of the synthetic fabric (especially if it’s an older cover and has been in the sun). We lost power around 5 am, and the wire was still partly live, and not grounded. Because there was no ground, our oven died, so did one power tool battery charger, 8 light bulbs (including 6 compact fluorescent ones), and an air purifier. The neighbors lost a TV set, and I’m not sure what else, because their power was connected to our power line. Our house was closest to the live wire, so I think we took the brunt of the damage. Lesson: Surge protectors for everything. Everything that was operating at the time of the accident fizzled out, unless it was on a surge protector. Luckily our fridge was on a surge protector. The oven was not because it’s difficult to position one behind it. Another friend told me that due to another black out and power surge, her fridge died. Maui Electric, MECO, won’t pay for the damage, saying it’s not their fault, even though the MECO repairman said the damage was due to their line. Around 9:30 pm on Valentine’s Day, Maui Electric showed up to fix our power. I’m so glad we decided to stay at home because they weren’t sure how to find us, especially at night, and had trouble getting down our driveway. Maui is notoriously windy and this is the second violent windstorm of 2015. Many trees got knocked down, including a huge eucalyptus tree behind our house. It landed on one fence of the chicken pen. A wattle tree fell on a neighbor’s cottage. Trees knocked down power lines along Kapakalua Road in Haiku and I saw a lot of fallen branches in Haiku yesterday. Another friend was picking flowers after the winds died down, and a tree suddenly fell down where she had been just minutes before. 5 banana trees in our yard got knocked down. No surprise here. Any strong gusts makes them keel over. One friend says that when strong winds blow from the South, aka Kona winds, that the trees can't handle it and will fall down. With the normal trade winds, from the north east, he says the trees do fine. Due to the Valentine's Day Wind Storm of 2015, our neighbor's cable line melted. No cable, no internet. He called Oceanic Cable to get it fixed and the repair guy came out and said he could not fix it because Maui Electric (MECO) needed to fix the power line first. So the repair guy closed the ticket, as if the repair had been done. MECO fixed the power line, so our neighbor called again to get the cable line repaired. Oceanic Cable told him they could not come out until February 25th, because they moved him to the back of the list for repairs. This is 10 days of waiting for internet. But he got his internet fixed today. How? Oceanic gave him a customer service survey and he gave them all "0"s for worst service in all areas. They responded by sending someone out today to fix his cable. We're still dealing with some aftermath from the storm. I have to clean up the yard again, and repair the chicken fence, again, but no one got hurt and that's the most important thing. Hi Courtney - sounds like a flurry of activity for you on Valentine's Day - being a New Englander, having never been to Hawaii, I just picture in my mind that it's all fun, warm weather, beaches....heaven. Never think of the fact that you actually get severe weather events, although I know you do, Our Valentines Day storm was a blizzard! Hope things are more calmer for you! Aloha Judi, Yes, we've been cleaning up! Hope you are coping with your severe weather too! Another sign of climate change perhaps? Didn't you just experience another windstorm? Hope all's well. Aloha Courtney! Amazing weather happenings there. Also here in South Africa a bit - extreme heat sudden cold. Glad no-one got hurt. Aloha Susan! We're getting some of that here too... even had a blizzard warning for the Big Island! I can see snow on top of the summit (I think it's Mauna Kea) from Maui. You're not kidding! I've seen those things get picked up and tossed like a crumpled up ball of paper. It's pretty scary when you consider that it's made of metal and sharp edges and stuff like that. I think that if you want to have something like that (especially somewhere where tropical storms are common) you're going to want it stuck into the ground with some kind of foundation. Otherwise it's going to go all Mary Poppins on you.